"My guardian is the planet of silence. I'm the soldier of death and rebirth, Sailor Saturn!" Hi all! I am Therissa also known as Glaivey. I am a huge Sailor Moon fan who started watching the show out of order. Started with Sailor Moon S - Stars and when I got a hold of the rest of my friends tapes I ended up watching the entire series in order. 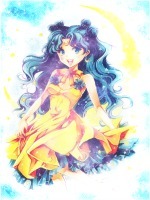 The Outers are my favorite Senshi with Saturn as my absolute favorite with Neptune at a close second. I love to read, write and pretend that I can draw. I went to school for history and anthropology hoping to be Indiana Jones but I work in an office that has nothing to do with what I went to school with. XD. I just got back into RPIng and I can't wait to get started again! you're here and I love it!! Yay it's mercury from the other forum! Hi everyone! I have missed you guys! Subject: Re: "My guardian is the planet of silence. I'm the soldier of death and rebirth, Sailor Saturn!"